We have been making a lot of our own Christmas decorations lately... mainly because it is something fun to do. I actually went out to the Christmas shops to buy some new decorations but they were all a bit cheap and nasty. In the end I didn't bother, I think we will just stick to making them. Speaking of making Christmas decorations we have made some fabulous salt dough ornaments. I have found a new recipe for salt dough and I like it. It is based on a recipe I found at Mum in the Madhouse, but I have adapted it a little. Instructions: Combine the salt and one cup of water in a saucepan. Bring to the boil, let the salty mixture bubble for a few minutes while stirring. I thought this process might dissolve the salt completely but it didn't. After a few minutes take the saucepan off heat and add flours and oil. Stir vigorously. 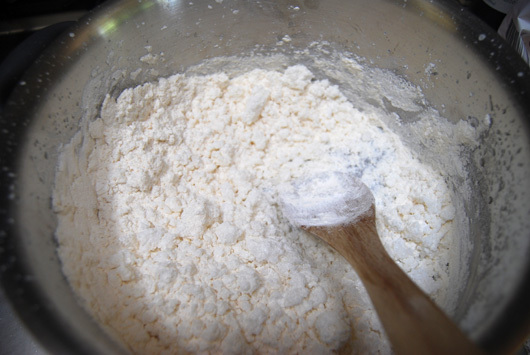 This is when I looked at my mixture dubiously – it was not a dough. I poured the whole lot on to the kitchen bench. 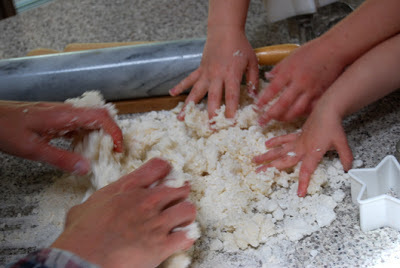 When it had cooled the kids helped me with the kneading. I slowly added cold water to the mix until we had a good dough consistency. Once you have turned your dough into shapes or sculptures bake in the oven at low heat (150ºC or 300ºF) for 3 to 4 hours. Keep an eye on it so the dough does not burn. Once the dough looked like a dough I divided it in half. I rolled out a portion for each kid and they cut out their Christmas shapes. Cakey poked a hole in each shape with a straw so we can string them up on the Christmas tree. 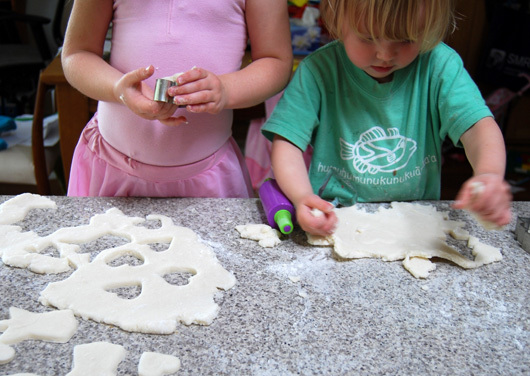 I carefully laid each shape on a lined baking tray and we baked the dough in the oven for 4 hours at a low temperature. 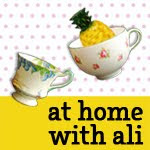 If your kids won't wait for hours to get their hands on their salt dough try Rainy Day Mum's quick microwave salt dough. 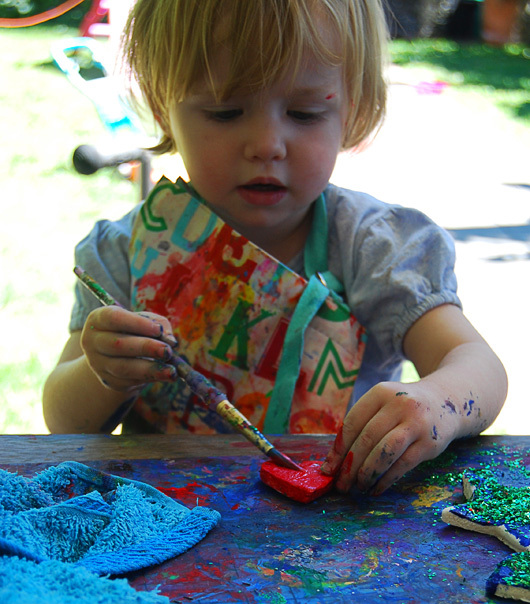 We didn't get to paint our salt dough until the next day. Every single piece was painted and glitter was added too. I have stored the ornaments away in an air tight container ready for the Christmas tree. 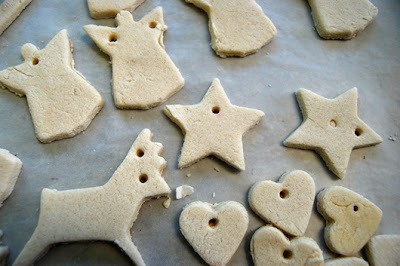 These salt dough ornaments are going to look fantastic! (Note: if you have issues with humidity you might want to seal with with a varnish as recommended by Learning 4 kids). 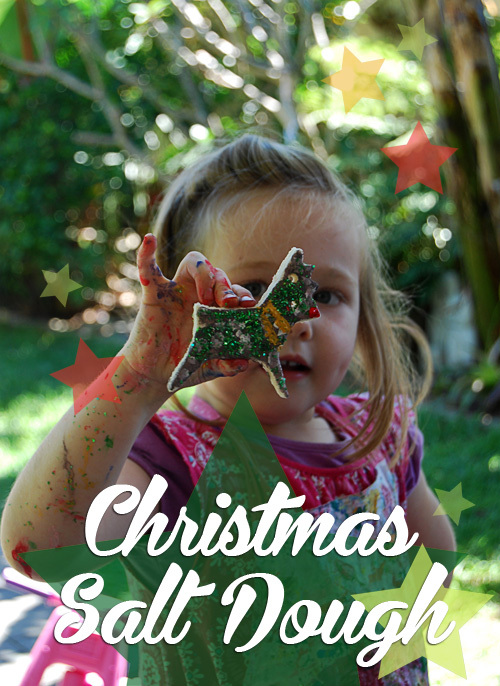 You can find all our Christmas craft ideas here. Thanks Cerys, they added a tonne of glitter!! The corn flour gave it a really light colour which I liked. Glad to hear that your salt dough lasted 10 years, I hope ours do too. Ha, we have a very similar post saved in our drafts folder. I do love your salt dough recipe though, it is very different to mine. I will have to link up to your post when I finally get my published. 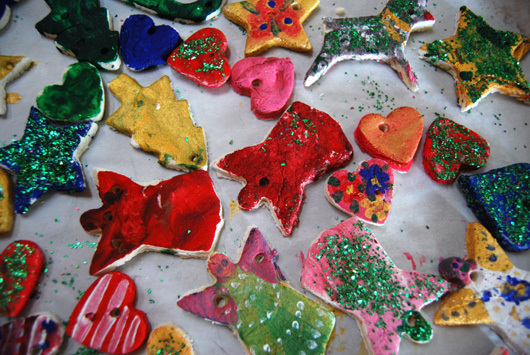 The glitter looks great on the your ornaments, will have to remember this the next time we make them. So cute. Looks like you had a great time doing it. Such a wonderful Christmas Classic. Perfect. We will definitely be doing it again next year too. I agree with you, they are so much nicer than all the plastic stuff in the shops. so cute! I'll have to give this one a go!